Click the error away by pressing the OK button. First thing to start with, make sure you entered all fields correct, if there was an error change it and try it again. Second possibility is your network adapter need some time to load the configuration, it times out the first time, wait 30 seconds after hitting the OK button and try again. Then third thing to try press < shift > < F10 > on the SBS 2011 this will open a command prompt, try if you can do a “ping sourceserver” and ping “sourceserver.domain.local”. Fifth option if time and date are right it could that the time zones differs, check the time zone on the source server and then on the SBS 2011 installation press or go to the command prompt if open from the previous step. At the command prompt type “control timedate.cpl”, make sure time zones are equal. Posted in Blog, SBS 2011 by ronnypot at June 3rd, 2011.
this is right on. I fat fingered the date and tie config and blew by it and could not login. date and time did the trick. I fired up task manager, opened notepad and put sourceserver in the hosts file. Worked fine after that. Thanks very much, I didn’t even think to check date again. I stupidly had set it up one week out. Only 4 hours wasted! Cheers again. see that it also can happen if the old server password is not strong / complex . you are completely right, the password must meet the password complexity requirements. great post. You have saved me a headache, for sure! This information is spot on. Great post, great help and thank you. Thanks for that. Fourth possibility was the answer. 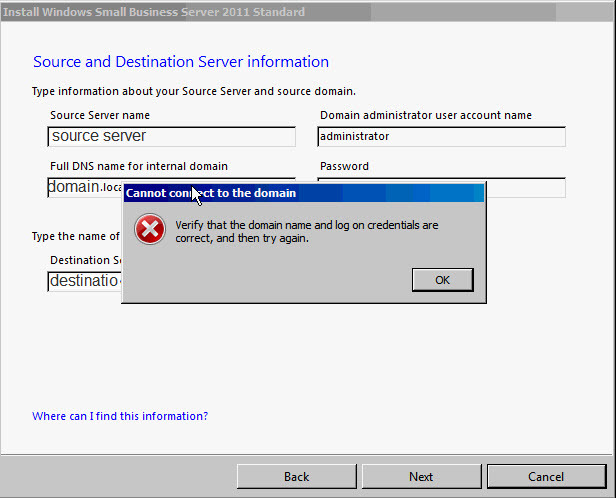 I am experiecing the problem of joing the destination server to the domain. I can ping the source server, but I cannot ping sourceserver.domain.local. Any Ideas? USing Shift F10 I can open a share on the source server which requires a loging and the login lets me in…. it sounds to me that the problem is the server is not using the right dns server. Can you do an ipconfig /all and check if it is using the source server as dns server? Thanks Man….. you saved my day.. So, I am encountering the same issue. However, it is not a time date setting. Not a password complexity issue. Can map a drive to the source server no problem, so, not an auth issue. Any other possibilities? Everything I’ve come across on the internet points to a time/date issue, effectively making it a kerberos/token issue. That’s definitely not the case here. Are there any other possible causes for this? I would suggest you take a look at the log files as mentioned and see if this does give you some useful information. If not you might try to create a post on the SBS Technet forum, there are a lot SBS professionals helping other people with problems. Thanks so much! It was the time and date in my case. Huge help. I’ve noticed on a different note that SBS 2011 migrations don’t like the HP Smart Start CD, my migration failed twice when using the CD and then went through fine without the Smartstart CD. It stopped at the SBSSETUP just after the above screen (in your post) and said that the service was not working and had to close. Finally found out that I had a duplicate ip address assigned to the destination server. It was an old wireless router set with a static ip that was outside of the dhcp scope of the source server. changed it and i’m off. Set the primary DNS server on the source server to the IP address of the destination server. for me the problem was that the destination server wasn’t on correct date ! after i change this, the setup continue. My issue was that the router’s IPv6 address was being used at the primary DNS for an unknown reason. To remedy this, I just started up explorer, navigated to the network interface and turned off IPv6. Reset the interface and everything worked. I have not have had any luck with moving past this error. I synchronized the time from the sourceserver and made sure that the time zone was correct. My last attempt was to physically unplug the modem to the Internet, disable to firewall and click next only for it to give me the same error. Another thing I tried earlier was to restore a backup to the new hardware but that only went into a loop of rebooting after the Windows boot screen started. With all of that being said, is it possible to do an installation from scratch on the new hardware and move all the user accounts along with their information (settings, emails, etc.) to the new hardware without doing this type of migration? If you do a clean installation you need to manual attach alle clients to the new domain, rebuilt all user accounts and profiles, etc, this can be done but it is a lot of work. Same issue. Had to disable IPv6 and Set the primary DNS server on the source server to the IP address of the destination server. Thanks Guys. This post was a life saver. Unable to changing the date and time of the server. Thanks for the tips.